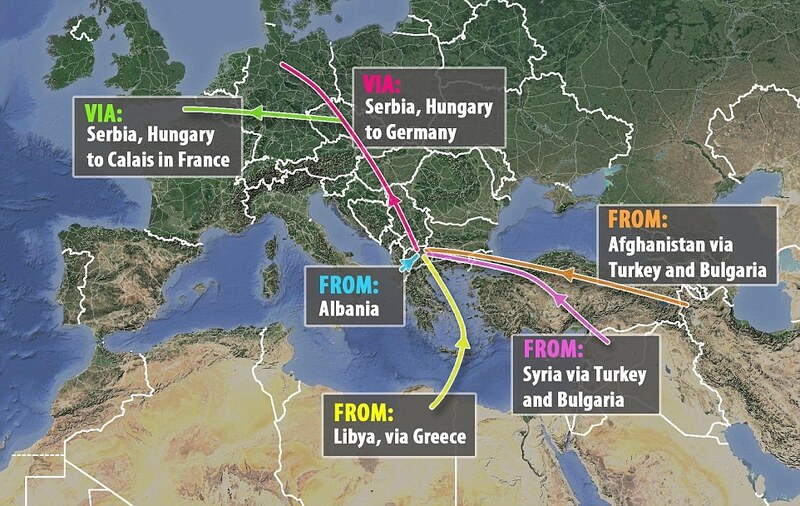 Home » The Grand War of "One Belt One Road"
Turkey and the EU have signed a deal discouraging non-Syrian, economically parasitical refugees from entering Europe. Nevertheless, 72,000 wealthy refugees with the cute label “economic migrants” are set to enter the EU from Turkey upon selection. The rest of the poor refugees will be sent back to their respective countries. Interestingly enough, these divisions of refugees into rich and poor and their selective management has led to intellectual disagreements among geopolitical think tanks across the world who are worried about the future of the EU and the increasing threat of terrorism in the world. Some European countries like Germany will take the brunt of refugees who are “Western-oriented”, i.e., those among whom so-called European values can be fostered and absorbed in closed circles. Yet another interesting fact is that the refugee crisis is such a “crisis” for Europe, not for Turkey. The European refugee crisis is a blessing granted by the US to Turkey to be manipulated and regulated according to Turkish whim. The EU is now completely dependent on Turkey for its security in regards to the influx of refugees. The European Union is set to give 3 billion euros ($3.4 billion) in financial aid to Turkey promised last year for managing the influx. An additional 3 billion euros will be granted to Turkey in the future. By the end of June, Turkish citizens will be able to travel to Europe without visas, yet several European countries are opposing this move. Since war will continue in the Middle East and is reaching the gates of Europe, refugees will either begin to make more desperate moves, or else they will be simply forced to. When warmer weather sets in, Bulgaria and the central Mediterranean routes will be opened again for refugees to enter, among other places, Southern Italy. In summer, it is expected that another huge wave of refugees will try to enter Europe through various hidden passages. Yet, if the controversial agreement between Turkey and the EU signed on March 20th is to be followed, Ankara will be obliged to take back any refugees deported from Greece and the EU, and the EU will in turn accept thousands of Syrian refugees directly from Turkey. The agreement also states that Turkey will accept the illegals back on March 20th, only for Turkey to send more refugees to the EU starting April 4th. Turkey will receive $6 billion in two installments. Turkey had previously chosen the bloody method of controlling the influx of war-torn Mideast refugees, but now it will nevertheless accept the ones it has been shooting at. It is now very clear that Turkey created such an inhumane crisis for its political and economic gain. On the other hand, the Western terrorist proxy ISIS will indoctrinate more people in Europe and engage them in carrying out terrorist attacks in order to create fear and insecurity amongst Europeans. Secondly, it will uses its brand name to claim a significant role in the war belt. If the present wars in the Middle East and related European terrorism spread into a fully-fledged regional war, it is fairly certain that the war will spread like a plague either from Afghanistan to Germany or from the South China Sea via Pakistan to Brussels within a matter of years. Such a long-stretched belt of conflict will make the Chinese and Russian projects impossible. Moreover, the war belt will pose an enormous threat to the domestic security of Russia and China. This war belt will create new regional powers supported by the West, and it is obvious that any wars close to the Russian and Chinese borders will pose a threat to them internally, since they have significant Muslim communities residing in their countries that would be affected socially and culturally. This very war belt will create a greater sense of insecurity and fear amongst the citizens of Russia and China, which will lead to internal political chaos. This is the master plan for containing the alternative bloc that threatens Western hegemony. And the interesting part of it all is that the European elites have approved this horrendous plan even though it costs the EU’s disintegration and the collapse of collective social, economic, and political security.